Up until fairly recently, I'd never listened to a podcast. It just didn't really appeal to me; I'm all about getting the tunes on and having a sing-song when I'm driving, but when I stumbled across Emma Gannon's Ctrl Alt Delete podcast a little while ago it totally changed my commute. Now, on the days I'm not really feeling the music, I'll whack a podcast on and end up feeling inspired instead. 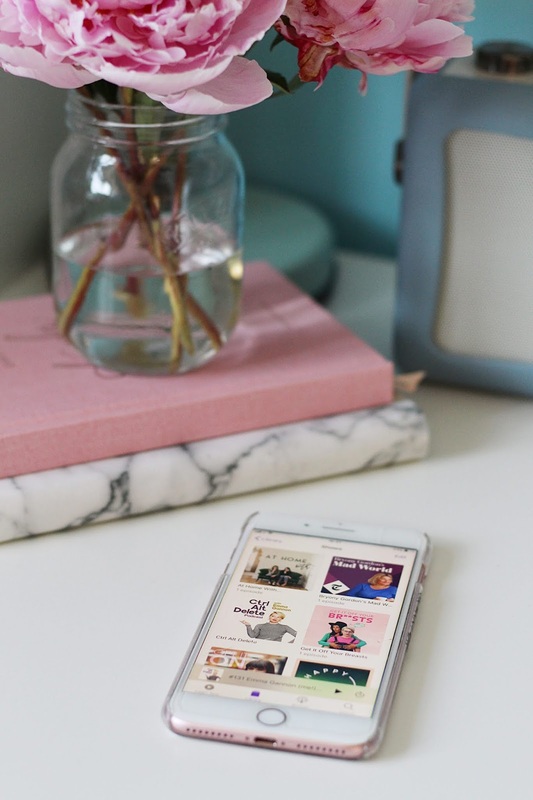 I thought I'd run through a few of the podcasts I've been loving lately, to give you some inspiration if you're looking for something different to listen to on your commute, when you're cooking dinner or even when you're walking the dog. I just have to mention the podcast that got me into them in the first place. Ctrl Alt Delete by Emma Gannon (writer and author of the book with the same name) is probably my all-time favourite podcast because each episode Emma chats to a guest about their relationship with the internet. The majority of her guests are self-made and built their empires through the internet, so this podcast never fails to leave me feeling really inspired about what I can achieve on the World Wide Web. Guests on the show include Zoella, Lena Dunham, Dolly Alderton, Jojo Moyes and Dawn O'Porter. It's definitely worth a listen if you're an aspiring entrepreneur or simply love all things internet. I know Lily and Anna way back from the early blogging days, so to see how far they've both come is amazing. When I heard they had a podcast I simply had to give it a listen, and now I'm ever so slightly addicted! Each episode, Lily and Anna visit the home of someone in the beauty/fashion/content creator industry, and have a snoop around their house whilst chatting about their career, how they came to be where they are and their interior style, of course. They've chatted to some amazing women, including makeup artist Lisa Eldridge, Tanya Burr, Patricia Bright, Callie Thorpe, Nails Inc founder Thea Green MBE and Liz Earle herself. A must-listen for beauty, fashion and interior lovers! Beauty lovers rejoice - this podcast is most definitely for you. Hosted by makeup artist Harriet Hadfield and self-confessed beauty junkie Lindsey Kelk, Full Coverage is perfect for anyone keen to hear the lowdown on the latest launches in the beauty world, find out about the top trends in beauty and hear from guests in the beauty industry as they share their current beauty faves. Previous guests include Elemis founder Neolla Gabriel, writer Sali Hughes and the queen of skincare herself, Caroline Hirons. This podcast is fresh, funny and never fails to make me smile. I love how the podcast shares honest reviews on the latest products whilst also discussing hot topics like the relationship between influencers and brands. Ever since reading 'Mad Girl' by Bryony I fell in love with her and everything she stands for, so naturally I had to give her podcast a listen - and I wasn't disappointed. Each episode Bryony chats to a different guest about their experiences with mental health, starting off by asking them how they are, really, feeling right now. It's a breath of fresh air to listen to people speak so openly and honestly about mental health and Bryony is a big character with oodles of enthusiasm, making her a total pleasure to listen to. Anyone who has ever struggled with their mental health simply must give this a listen. Another must-listen for beauty addicts, The Emma Guns Show is an incredibly popular podcast with over 3 million (!!!) downloads. I can totally see why it's a hit - I find Emma super easy to listen to and whether it's her on her own talking all things life and beauty or with a guest, she always keeps me entertained. I love that Emma mixes beauty chat with more in-depth conversations about life, mental health and everything in between. She has had some amazing guests on her show, the majority of which are in the beauty industry in some way. She's spoken to the likes of Sam and Nic Chapman, Caroline Hirons, Lisa Potter-Dixon, Lily Pebbles, Sali Hughes, Ruth Crilly... the list goes on. If you're interested in the world of beauty, "influencers", entrepreneurship and mental health then this is the podcast for you. So there you have it - my top five podcast picks. What are you listening to at the minute? Let me know!